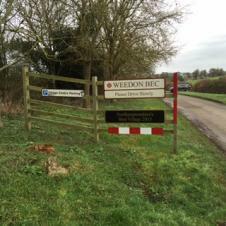 Weedon Bec were the recipients of Best Large Village and Best Overall Village in Northamptonshire in this competition for 2015. Its not all about pretty flowers and window boxes but everything to do with the community, what the village does, what groups we have, how our residents are looked after especially the older and younger generations and lots more besides. 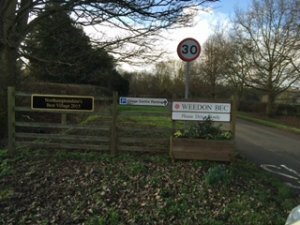 Weedon really does have lots of community spirit and lots that goes on - lets keep this up because its what helps to make our village special. Weedon Sports Association volunteered to complete the application for 2015 - so many thanks to their volunteers John Wilshire, Tony Wincott and Sue Butler for completing this plus the many village group representatives who helped provide information and came to meet the judges when they came to visit. Also to Riverside Court who allowed us to use their lounge to meet and greet and have a cup of coffee on judging day. Please take a read of the application form - even you may be surprised at the myriad of what takes place and the groups, businesses and facilities our village has. 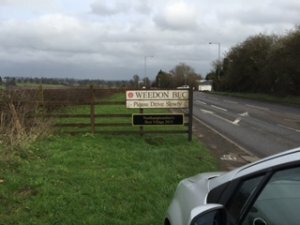 Better still, take a read of the feedback from the judges visit to the village - it really does sum up Weedon delightfully. We should all be very proud of living and being part of this village community. We have a year off in 2016 but we will be back in 2017!